Commemorative coins honoring the 225th Anniversary of the U.S. 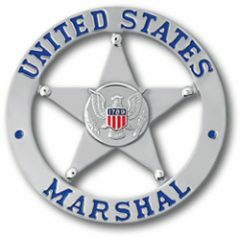 Marshals Service are likely after legislation proposing them was approved in the U.S. Senate on Thursday, March 15, 2012. An amended H.R. 886, named the United States Marshals Service 225th Anniversary Commemorative Coin Act, was approved by Unanimous Consent in the Senate exactly three months after the original bill passed in the U.S. House on December 15. "Our U.S. Marshals demonstrate integrity and commitment to their communities, and I’m pleased this coin will support efforts to highlight their unique history and service," said Sen. Mark Pryor [D-AR], who, along with Sen. John Boozman [R-AR], introduced a Senate version of H.R. 886 over a year ago. "It was an honor to work with the Fort Smith community and the entire delegation to get this legislation passed." H.R. 886 was amended to include a clause stating that production of the commemorative coins could not result in any "net cost to the United States Government" and that surcharges could not be distributed until the U.S. Mint’s cost of designing and issuing the coins was recovered. The bill must now return to the House for approval, which is expected. The finalized legislation will then be sent to the President for signing, which is also expected. Once signed, the U.S. Mint will have authorization to strike up to 100,000 $5 gold coins, 500,000 silver dollars and 750,000 clad half dollars for sale during calendar year 2015. They would include both uncirculated and proof versions. As outlined by the Act, the gold and silver commemorative coins would have an obverse depicting the famous US Marshals Service Star, also known as "America’s Star." The obverse of the half dollar must be emblematic of the Service and its history. For the reverses, the $5 gold coins must portray the sacrifice of members who lost their life in the line of duty, the silver dollars signify the Marshals "legendary status in America’s cultural landscape," and the half dollars depict the role US Marshals have played in changing the history of the United States. Also required by the United States Marshals Service 225th Anniversary Commemorative Coin Act, each of the coins would include surcharges — $35 per $5 gold coin, $10 for each silver dollar, and $3 per clad half dollar. The first $5 million collected would be paid to the U.S. Marshals Museum (www.usmarshalsmuseum.com) to help preserve, maintain and display artifacts and documents. "The commemorative coin recognizes the influential work the men and women of the U.S. Marshals Service, the country’s oldest law enforcement agency, have done and continue to do for this nation," Sen. Boozman said. "Creation of the coin gives us the opportunity to highlight Arkansas’s role in the development and growth of our nation and, as an added bonus, benefits the U.S. Marshal Museum in Fort Smith." Any remaining funds would be split between the National Center for Missing & Exploited Children, the Federal Law Enforcement Officers Association Foundation, and the National Law Enforcement Officers Memorial Fund. I have to admit, Matt Dillon did come to mind, but also Wyatt Earp, and Sam Gerard (AKA Tommy Lee Jones). The design will look great on the silver coin but not as impressive shrunk up on the $5 commemorative gold coin. Hey; wouldn’t it be cool if they made this commem coin EXACTLY like a real badge, meaning with the inner material “cut-out” leaving just the 5-point star image in the center of the coin? The diameter would have to be larger to compensate for the void, but I think it might look way cool..!